The recombinant human interferon gamma (rhIFN-γ) that is produced in E. coli by a method based on recombinant DNA technology, increases macrophage cytotoxicity. In this study to evaluate the structural characterization of rhIFN-γ, considered two conditions: fresh sample (4°C) and old sample (6 months in 25°C) of rhIFN-γ. Fresh sample (4°C) and old sample (6 months in 25°C) analyzed by analytical methods for determination of biological activity and structural analysis (deamidated and oxidized, heterodimers, monomer and aggregates, covalent dimer and SDS-PAGE). The structural characterization of them was compared. N. MalekSabet, M.R. Masoumian, M.A. Nasiri-Khalili, N. Maghsoudi, H. Sami, A. Saeedinia and R. Mohammadi, 2008. The Structural Characterization of Recombinant Human Interferon Gamma. Journal of Biological Sciences, 8: 1087-1091. The human interferons (hIFNs) are a family of proteins. The initial discovery of which was based on their ability to inhibit viral growth in target cells (Friedland, 1996). Their biological effects in vivo include antiviral activity, cell growth inhibitor and immunomodulator activity (Pitha, 2007; Dheda et al., 2005; Perez et al., 1990; Chen et al., 1992). IFN-γ is more potent than the other two IFNs (α,β) in its immunomodulatory activities. The antiproliferative effects make it a potentially useful against cancer (kidney cell carcinoma, colon cancer and rheumatoid arthritis). The IFN-γ is secreted by human antigen stimulated T-lymphocytes in response to viral infection and various other inducer. The native human interferon gamma is composed of 143 amino acid residues with a total molecular mass of 20-25 kD. It is glycosylated and does not contain cysteine residues (Khalilzadeh et al., 2004; Mohammadian-Mosaabadi et al., 2007). In 1986, hIFN-γ cDNA was cloned and expressed in Escherichia coli. This rh-IFN-γ produced in E. coli is not glycosylated and has methionine as its N-terminal residue. The total molecular mass of rh-IFN-γ is 17 kD that it is physiologically active (Pitha, 2007). The protein consists of non covalent dimers of two identical monomers. Recombinant proteins expressed in genetically transformed cells must accurately represent the natural molecules that they are intended to replace or complement. They should also fulfill the minimum requirements for biological efficacy, safety and quality criteria as do other preparations intended for pharmaceutical use (Zhang and Tong, 1992). The deferent testing is done for evaluation of this recombinant product so as biological activity and structural analysis. This study describes the characterization of final product of rhIFN-γ as structural analysis: covalent dimer and oligomer, deamidated, oxidized, monomer and aggregate form of hIFN-γ in fresh and old sample that described and comparison of the electrophoretic pattern and biological activity was done. Analysis of covalent dimer: Size Exclusion Chromatography (SEC) with HPLC method was used to check purity of rhIFN-γ and the presence of undesired form including covalent dimer. The column (7.5x300 mm 10,000-300,000 Dalton), ultropak TSK G3000 SW LKB was equilibrating with sodium phosphate buffer (0.2M, pH 6.8) at a flow rate of 1 mL min-1 and mixture of molecular mass standards, BSA (66 kD), trypsin inhibitor (20.1 kD), lysozyme (14.4 kD) as resolution solution, fresh sample and old sample of rhIFN-γ as tests solution were used. The effluent was monitored at 210 nm. Analysis of deamidated and oxidized forms and heterodimers: Ion Exchange Chromatography (IEC) with HPLC method was used to check these forms of rhIFN-γ. The column (IEC sp-825 Shodex 8 mm ID x 75 mm L-1) was equilibrated with ammonium acetate 0.05 M, pH 6.5 (buffer A) and developed with a linear gradient (100-0%), (0-100%) ammonium acetate 1.2 M , pH 6.5 (buffer B) in a 57 min period at flow rate 1.2 mL min-1 in 35°C and tests solution (fresh and old) were injected and detected. The effluents were monitored at 280 nm. Analysis of monomer and aggregates: The column (7.5x300 mm 10,000-500,000 Dalton), ultropak TSK G3000 SW LKB was used to check monomer and aggregates form of rhIFN-γ. After equilibrating of column with potassium chloride (1.2 M) in solution A (0.59 g L-1 Succinic acid and 40 g L-1 mannitol pH 5) at flow rate 0.8 mL min-1, 20 μL of each, resolution solution (BSA + Imukin), tests solution (fresh and old) were injected and detected at 214 nm. Analysis of purity of rhIFN-γ by SDS-PAGE: This analysis was carried out by SDS-PAGE. The test was performed under reducing conditions using resolving gels of 15% acryl amide and silver staining as the detection purities fresh and old samples of rhIFN-γ. Assay of biological activity: The method relies on viral cytopathic effect (CPE) inhibition using semi-micro dyebinding technique in IFN-treated cells and comparing activity of rhIFN-γ with standard samples of IFN-γ. The assay was performed by incubating a fixed count of vero (African green monkey kidney) cell line with serial dilutions of rhIFN-γ followed by challenging the cells with defined plaque-forming units of Vesicular Stomatitis Virus (VSV), all according to standardized procedure (Tsanev and Ivanov, 2001; Mohammadian-Mosaabadi et al., 2005). The interferon activity was calculated as the reciprocal of the dilution in the well of the titre plate where 50% of the vero cell monolayer is protected from the CPE of challenging virus. The standard interferon gamma was used in this test is WHO standard as: Interferon gamma, human 88/606 (National Institute of Biological Standard and Control Blanche Lane, England). The rhIFN-γ is a single chain protein has a molecular mass of 17 kD, The active form of it is considered to a homo dimmer in which two monomers are none covalently bound in anti parallel Orientation (Tsanev and Ivanov, 2001; Walsh Gary, 2003). So, in characterization of rhIFN-γ is necessary to determine possible covalent dimer forms as undesired product that form in the assessment of covalent dimers was done by gel filtration HPLC. Figure 1 shows the fresh sample in 4°C of rhIFN lacks the covalent dimer forms but HPLC analysis of a rhIFN-γ stored for 6 months in 25°C, shows the peaks with approximately 35 kD and higher in comparison to molecular weight standards (BSA, Trypsin inhibitor, Lysozyme) that seems belongs to covalent dimmer forms. Since, the rh IFN-γ has no cysteine residue; the forms are not disulfide linked dimmer. Since, one source of protein variability comes from oxidative protein modification to analysis of rhIFN-γ The examination of oxidized and deamidated forms of Protein was considered. Generally, these modified forms are produced during manufacturing process or storage of proteins. In order to determination of deamidated and oxidized forms, the fresh sample in 4°C of rhIFN and the old sample stored 6 months in 25°C was examined by strong cation exchange chromatography. The data are shown in Fig. 2, in old sample principal peak (rhIFN-gamma) is about 27.4 min and heterodimers 25.4 min, deamidated and oxidized forms in 26.2 min were eluted at shorter retention time, relative to principal peak. Fresh sample contains any unmodified (deamidated, oxidized, heterodimers) gamma interferon. In the purification process of rhIFNγ during unfolding and refolding reactions, Some portion of monomers doesn`t assemble in to active dimer forms and remain as monomers forms. Protein aggregation is a common issue encountered during manufacture of bio pharmaceutical drug. Although the aggregated forms are removed during purification process by SEC chromatography and so on but it seems, some these forms because of stresses can lead to protein aggregation, are observed in final product. So, the rhIFNγ was analyzed by analytical SEC based on difference in size of monomer and aggregates that the peaks of monomer, native dimer and aggregated are isolated. Figure 3 shows that fresh sample is followed the pattern of commercial rhIFNγ in standard sample that contains native dimer form without any monomer and aggregate form. The old sample has a little aggregate form and no monomer. In Fig. 4, the comparison of electerephoretic pattern is shown that the old sample has a band between 35 and 25 kD bands of standard sample that it may be is related to covalent dimer and a band between 14.4 and 18.8 kD region is belonged to monomer form of IFN in while the fresh sample has a one band in monomer region. The most convenient method for interferon assay is quantitating its antiviral activity or inhibition of cytopathic effect (CPE). In this research, we looked for a fast and sensitive method to quantitative antiviral activity of this cytokin based on cytopathic effect/dye uptake. After standardization of method, activity of fresh and old IFN-γ was compared to standard sample (WHO standard) (Fig. 5). In regard to biological activity of standard sample, 20x106 IU mg-1, the biological activity of fresh sample is near the WHO standard, but biological activity of old sample approximately two times decreased. 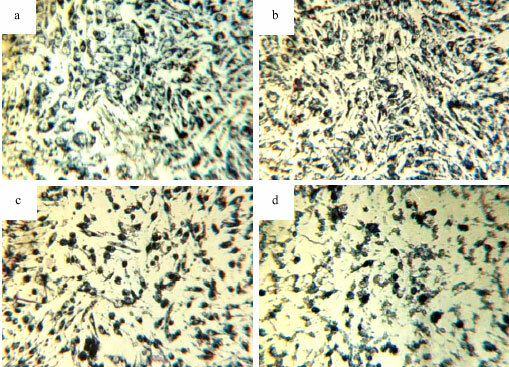 Antiviral activity of rhIFN gamma in vero cell line shown in Fig. 6. According to obtained results, we can observe that rhIFN-γ is a sensitive protein. Modifications of rhIFN-γ such as deamidated and oxidized, monomer, covalent dimer and aggregate happened in during life time (0 and 6 months) and temperature change (4 and 25°C). These modifications change the structure of rhIFN-γ and decrease approximately two times biological activity. It may be these assessments are so necessary for this protein using as a recombinant pharmaceutical drug. Chen, A.B., A.A. Championsmith, J. Blanchard, J. Gorrell and B.A. Niepelt et al., 1992. 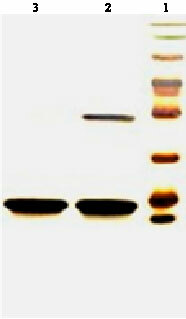 Quantitation of E. coli protein impurities in recombinant human interferon gamma. Applied Biochem. Biotechnol., 36: 137-152. Dheda, K., Z.F. Udwadia, J.F. Huggett, M.A. Johnson and G.A. Rook, 2005. Utility of the antigen-specific interferon-gamma assay for the management of tuberculosis. Curr. Opin. Pulm. Med., 11: 195-202. Friedland, J.S., 1996. Chemokines in viral disease. Res. Virol., 147: 131-138. Khalilzadeh, R., S.A. Shojaosadati and N. Maleksabet, 2004. Process development for production of rh IFNγ expressed in E. coli. J. Ind. Microbiol. Biotechnol., 31: 63-69. Mohammadian-Mosaabadi, J., H. Naderi-Manesh, N. Maghsoudi, M.A. Nassiri-Khalili, M.R. Masoumian and N. Malek-Sabet, 2007. Improving purification of recombinant human interferon γ expressed in Escherichia coli; effect of removal of impurity on the process yield. Protein Express. Purif., 51: 147-156. Mohammadian-Mosaabadi, J., H. Naderi-Manesh, N. Maghsoudi, R. Khalilzadeh, S.A. Shojaosadati and M. Ebrahimi, 2005. Effect of oxidative stress on the production of recombinant human interferon-gamma in Escherichia coli. Biotechnol. Applied Biochem., 41: 37-42. Perez, L., J. Vega and C. Chuay, 1990. Production and characterization of human gamma interferon from E. coli. Applied Microbiol. Biotechnol., 33: 429-434. Pitha, P.M., 2007. Interferon: The 50th Anniversary. 1st Edn., Springer, New York, USA., ISBN: 978-3-540-71328-9. Tsanev, R.G. and I.G. Ivanov, 2001 2001. Immune Interferon: Properties and Clinical Application. 1st Edn. CRC Press LLC, USA., ISBN: 0849311489. Walsh Gary, 2003. Biopharmaceuticals: Biochemistry and Biotechnology. 1st Edn., John Wiley and Sons Ltd., New York, USA., ISBN:0470843268, pp: 150-167. Zhang, Z. and K.T. Tong, 1992. Production, purification and characterization of recombinant human interferon. J. Chromatogr., 604: 143-155.